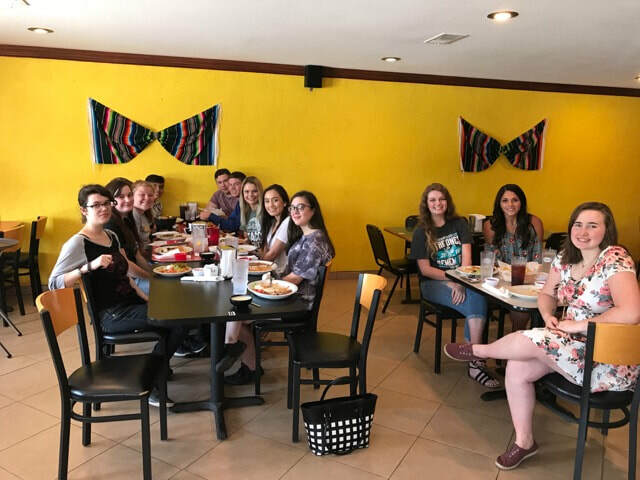 Purdy High School National English Honor Society advisers Kayla Branstetter and Michelle Hilburn hosted an end-of-year Literary Luncheon for the 15 student writers and artists who saw their works published in literary journals during the school year. Journals featuring Purdy Eagle works include the Crowder Quill, Young Voices of Missouri, Ozarks Hills and Hollows and Ozark Electric Company’s essay collection. The luncheon was held at Adelita’s Mexican Restaurant in Purdy. Published attendees are pictured clockwise, from left to right: Anna Snuffer, Bayleigh Schad, Shana Whisman, Jose Perez, Adam Humphrey, Joby Young, Emma Harkey, Isbel Ibarra, Hannah Reid, Megan Hibbard, Layne Skiles and Savannah Burch. Also published, but unable to attend the luncheon were Nicole Townsend, Julissa Cruz and Anah Dover.